You can export a Designation List to a file by right-clicking the List in the Designations tab and hovering over Export and then selecting a file option. These files are explained below. TEXT - There are options available, depending on what your needs are. 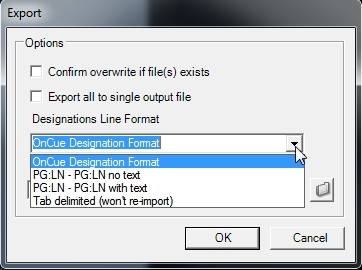 OnCue Designation format would be the same format as an import file, complete with headers. The other options are basic text files that use a "pg:ln to pg:ln" format, either with or without the transcript text. They are similar to what a report would be, but very stripped down and in a txt format. The final option is a basic tab-delimited text file that contains pages and lines of the designations but stripped of the OnCue header information, and could therefore not be used as an import file. XML - Exporting to an xml file creates a much more complex file that contains a lot of additional data beyond basic page/line and header information. Although they could technically be edited, that is not their purpose. We created this format to be able to move Designation Lists from one OnCue database to another and carry over all information contained within it. This includes the synched transcript itself (optional), tuning information, document links, document clears, and document treatment information for the documents linked (also optional). This is the file you want to use the majority of the time. It allows the transfer of all the necessary information (except for the source documents) in a single file. A couple of great real-world uses for this: a second tech in a remote location could create a Designation List in OnCue, tune it, link documents, then export the xml file and email it to a second user. The second user could then import that file into their OnCue database already tuned, linked and ready to play (as long as the second user had the same source exhibits if there were document links included). It allows true co-op from different locations. Another example would be transferring from one OnCue database to a new one for a serial litigation. 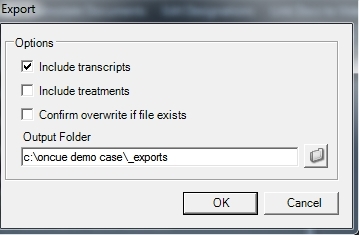 Often the same or very similar designations are used in serial matters and this allows you to export from an already completed case and import it into a new one, instead of having to use an old database or repeat work you've already completed. EDL - Exports the Designation List to an Edit Decision List, or edl. This file contains advanced time code data and media source info that can be loaded into an advanced third party media editing program to create a video file. For the advanced video editing guru only. Video File - Exports the Designation List to a video file, either MPG or WMV. For wmv, the video file must be encoded (it uses Windows Media Encoder to convert from MPG), so this can take some time, especially with longer Designation Lists. 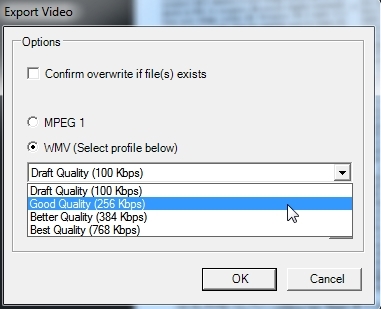 While MPG can export faster than wmv, there are major advantages to wmv, including quality options (keeping high quality or lowering quality to decrease file size) and more universal playback. It's up to the user how much quality is worth compromising for file size.